There has been a lot of buzz about Bitcoin lately since it’s Dollar to BTC value has skyrocketed this last year and especially month. I heard about it way back in 2009, so I fiddled around with mining for a week or two. 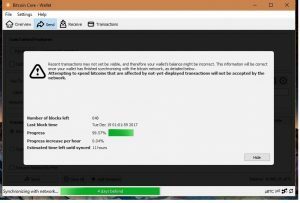 I visited a website that had a “Bitcoin faucet” which gave away 5 cents of Bitcoin (or 50,000 µBTC), so I had that in my wallet, but I pulled the plug since my 2009 laptop was way under powered to mine. So my 5¢ of Bitcoin sat in deep storage until Thanksgiving 2017. Bitcoin was nearly worthless until randsomware came around which made people exchange dollars for Bitcoin to pay the criminals. It has also been heralded as a “Cryto-currency” and such, but I would like to argue that it is nearly worthless as a true currency and has been behaving more like a gold investment or other commodity investment. When the exchange rate of BTC for $ was 11K, I decided it was worthwhile enough to find where I’d stored away my Bitcoin wallet. I found it okay, but my Bitcoin-Core app was so out of date that it wouldn’t connect to the Bitoin distributed network. After updating, I copied my wallet into the app, but I couldn’t make any transactions to an exchange account until my 2009’s 250 MB blockchain had been updated to the current 157 GB (!!!) blockchain. This took 2 weeks because it kept freezing, so I’d have to start it over and -reindex and -rescan and wait and wait because my 2017 laptop isn’t powerful enough I guess. The Bitoin Core-QT app also hogs the hard drive system resources (100%) even though the memory and processor power are barely used. ANYWAY, it worked out great for me because during the next two weeks, 1 BTC went from $10K to $19K. After finally updating my block chain, I was able to transfer 4¢ of coin to an exchange account, but I didn’t realize that the miner’s fee is really important, so I tried to underbid, which led to my transaction not being processed at all. So I figured out how to abandon that transaction and then conceded to the recommended mining fee. 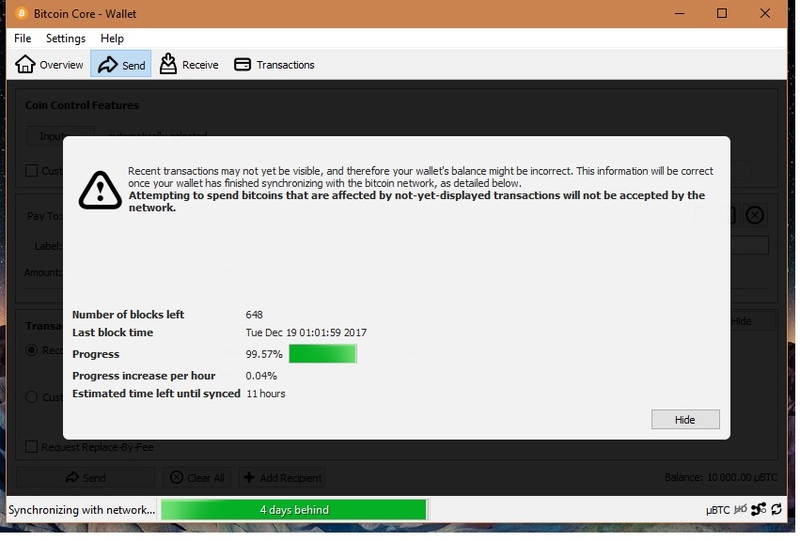 After bidding for a “4 hour fee” my transaction was finally confirmed 12 hours later, so I immediately cashed out when it was $18K/BTC. So everything worked out for me, but note how my story makes it obvious that BTC will never truly be a currency or money. If I go to a pizza restaurant, I can’t pay with Bitcoin because the transaction would not be finalized in time before I’ve already eaten my pizza and gone home (unless it was a 1980s era Pizza Hut in which case you bring a bag lunch so that you won’t get hunger pains by the time your pizza arrives for dinner). Also, the shop owner isn’t going to want such volatility in the value of the currency being accepted. Every time a consumer pays a shop owner with BTC, the consumer has to pay the transaction fee, which is opposite of the current plastic card model. And don’t forget that there is also volatility in how much one has to pay the miners to get a transaction processed in a reasonable amount of time (or if ever).